I have been working my spirituality for many months and increasing my connection with time, but I feel that I have some kind of blockage, because I can not really understand my intuitions, get in touch with beings and see them, or even see any kind of energy . I would like advice on how to make the connection and feel and see the other dimensions. Thank you in advance! The old father is here to bring you some words. And also, son, about hearing things. Think it's the same as seeing, son. Will not listen to just not beautiful thing. There's a lot of dense energy walking around, son, a lot of people needing help. And it is a great divine grace that you have to be in that physical body, which is the dimension of matter. For you would not like to see what you have in the next dimension of matter, and not listen, son. This is a wonderful grace that God gives you, son. So focus on expanding your awareness. The expansion of consciousness through meditation, son, will bring you closer to the higher dimensions, and then, son, you may feel something different in your life, a peace that takes care of you, which has nothing equal . Concentrate on expanding your awareness, son. So you will be very happy and you can feel the energies that will really do you good, son, and make you happier. I have had depression for about 12 years, until by spiritual treatment I feel healed. As I have been dependent for a long time, I want my financial independence today, but I have a lot of insecurity, low self-esteem and it seems that nothing comes from my heart to do. I have no joy at leisure, my friends, I always prefer to be alone, I have not had a reciprocal relationship for ten years. I have a profession that does not motivate me, I feel capable enough, but I really wanted to find a job that I felt motivated and liked. And I wanted to understand the lesson of not being loved by a partner I love. The love you seek is not outside of you, but within you. You search deep down for this truth. And it was the turning away from this purpose that made her go through a painful process that gradually transformed into a huge inner force. When you discover from yourself all that strength you hold you will be able to love yourself. And from that love you will find everything you seek. See my beloved, how far she has walked, how far she has progressed, for you are already able to feel good in the position you are in, to feel cured. You see that the painful process that has passed is what has just brought you to this condition. And in this state of self-love you will look at yourself in a different way. You will be able to give and receive love and then you can relate not only to partners, but to everyone around you. This state of solitude was necessary for her to find within herself the power to be well for herself. But you do not need it now. You can already take the next step, which is to start looking for groups that share reciprocal interests, to seek people who resonate with their energy. You are ready, my beloved, to the next step in the development of your own love. You passed the phase of loneliness and the deep pain of your soul, found the strength to stand up. Now you just have to find what you like that interests you, because naturally people who resonate with the same interest will come to your life. It will be an ongoing, yet natural process. May my sister be in peace, in the understanding that a new horizon presents itself to you at that moment. I am Nada, your sister. 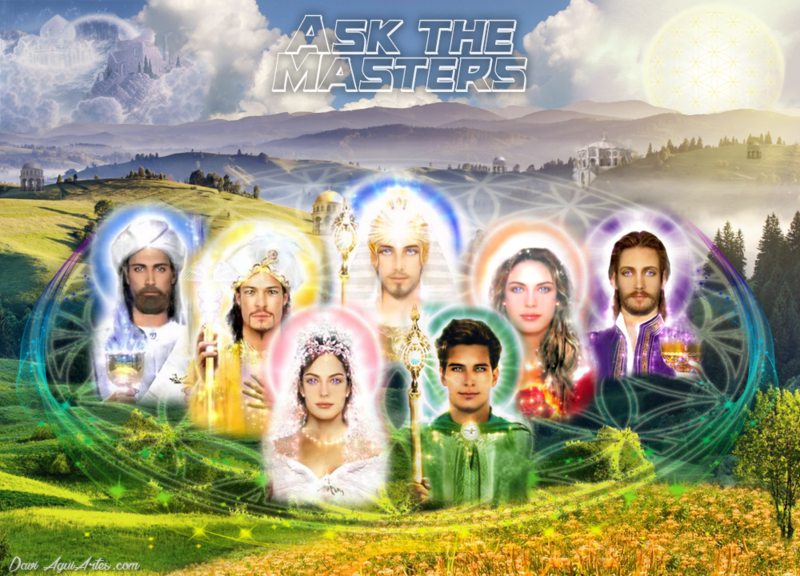 I would like guidance from the Masters, because I feel somewhat lost. I was Catholic, then charismatic, then a Catechist for ten years and a Umbandist for four years. In December, the Umbanda center I worked closed the doors and today I understand that all are cycles, but now what? Where to go? For I feel that I have much to do, but I feel wandering aimlessly it seems that I am in a boat adrift. I know I'm not alone, but I also know that there are chains to be broken I need help. I feel stopped in time and in my mission, what I have come to do is not being done. The time is passing and I can not find answers, I could hear Indian friend twice speak in my ear. I am Poty India and in another ... it continues to be ruined ... I ask for a light. Gratitude. I'm here to put some words for you, child. Your Indian wants to work, yes, but she already learned the lesson that she had to learn where you were, daughter. And you too. The cycle is closed, daughter. You will work, yes, daughter, but it is no longer in those places that you have worked, daughter. Follow your heart, daughter. Focus your thoughts. You do not have to be looking for something, daughter. What you need will come to you, daughter. But it will only come if you pay attention, daughter. For this, you must live in the present, daughter. You keep thinking about what happened and wonder what might come. But, do so, daughter, be quiet, that now you are working in your time, calm and with pause. Stay quiet, daughter. That this time is necessary to empty the little head that is full of things. But as soon as you empty, my daughter, that you will free yourself from this anxiety, your new apprenticeship will come, my child. Your Indian already knows that, daughter. Trust in God, daughter. Anchor in the heart and wait for the signs, daughter, that this will come to you, yes. You're going to work a lot in the light, daughter. The willing workers are never out of work, daughter, but they are the ones who are always changing their learning, to be more prepared and to help more people. Stay in the light, daughter. Dear teachers, I ask for guidance in my personal life. I am 42 years old and single. My love relationships are always interrupted, leaving me without ground and without joy. My last relationship was with a man I met two years ago, he told me he was separated, we started to relate and it was an immediate recognition, as if it was a reunion. I never felt for someone such a strong feeling, so pure, I felt full and very happy! We planned travel, marriage, and children. But as time passed by I was already totally enveloped by that love, I discovered that in fact it was not actually separated. He told me it was because of the daughter of this relationship, that he did not want her to feel what he felt in childhood, since he did not know his father and was raised by an aunt and grandmother, he was never close to his mother and father. But he asked me to wait for him, that he would work everything out to be together. After about six months of relationship, he changed jobs and moved in with me from Monday to Friday, and on Saturdays he would return to his home in another city to review his daughter. We lived together like that for six months, but when Christmas came he traveled with his family and when he came back, he broke up with me because he said that he had to stay with his daughter and stay at his house. And since then, a year ago, I have no more joy to live. My life is just work, I could not forget it. And he looks for me sometimes to know how I am if I have left, he worries about my health. I feel we still have a connection. I feel very lonely, my dreams of forming a family and having children have not been realized until now. I'm afraid to be alone, grow old on my own. Sometimes I ask myself what I am doing here in this world, what my role is, because I am here, because this solitude, this relationship with this man and why I do not forget him. Please help me understand these issues. Eternal gratitude. What you need to understand, is that if you are feeling it is only because you have not found yourself. The deepest solitude and the feeling of non-completeness are due to the fact that we are not filled by ourselves, by our self. Because we did not meet. External search exists only in the mind. You live in the midst of matter on this planet, but you forget that it is only a passage and you have chosen that experience to strengthen yourself. For if it were not for this purpose, my beloved, what would it be? You are here fulfilling a mission, a mission with yourself to find your strength, your mastery and discover your magnitude. You are a strong woman, with a lot of love, but you are being driven to chance, and to everyone but yourself. The strength of my dearest that you undertake in your life has always been directed toward achieving material goals connected with relationships or dreams of realities that you have created in your mind. But at no time loved, even in the face of this incessant repetition of experiences, did you realize that all this effort and all this love should have only one direction, your own heart. My dear, do you think that directing your love to yourself will be solitary? You deceive my beloved, for when you direct love to yourself, you open a channel with God, with the highest beings in the universe and with the abundance that comes along with the divine connection, for God is abundance, God is completeness and love . When you open this beloved channel, you will see how your life will be filled with full achievements, surprises and wonderful experiences that are all reserved for you, waiting for you to overcome your fears of surrendering your heart to your truth and to God. Stay in peace my daughter. Since I was little I had a bad feeling inside me, I only saw hatred, intrigue, anger and it made me a bad child with hate in my heart. I did wrong things that I regret today. At times, it seems to me that this child could not be me, I did not see myself in that child that I was sometimes and wonder what could have really happened to me to act like that. I think there's more to it than that. I wanted to understand if all this was destined or if I got out of the way, I do not understand very well and wanted an explanation. Thank you. Her purpose in the past was what brought her into the present. Her past life was the one who made her the one who questioned the truth. See the blessing of it and say: it could have been worse, but no, I'm here today better than before. What is the guilt that we bring to our heart from the acts of the past? Why do you live them so intensely in the present if it was they who brought us right here in this now? When we bring the past with such bitterness of soul and bitterness, we are reviving it within ourselves, we are giving it strength. From our perspective my beloved, we see her as a beautiful being of light that has expanded, developed and has already left the nursery school, which now seeks for its growth. You understand that we do not judge you, but we are able to see the beautiful experience that has led you to the now. Thank the opportunity to be here my daughter, to have reached that point. See the Divine Grace of the path of learning, improvement and purification. The past must be brought into the present not with the feeling you nurture, but with love, as opportunity, as that which has made us great. And then everything is fine. Stay in the inner peace of the certainty that the best has happened and will always be given. Beloved masters, I face a phase of stagnation in life. I feel that nothing flows easily and gracefully, situations recur and I make no progress. I am doing a job of identifying and releasing limiting beliefs and emotions through EFT, but it seems that there has been a worsening in my picture, as I feel more angst and depression, plus an unexplained growing anger. What can be revealed to me about this moment that I go through? Gratitude. Beloved son, situations recur even with the treatment and your anger appears as a reflection of something that you still do not want to let go. Anger and anger feelings are just to show us that something needs to be released. Look inside yourself and accept what you are not letting go. There is no treatment that is effective when you guard inside and you do the hidden side of Being and do not allow the treatment to act on yourself. A big step already taken, to realize that situations are repeated and also to perceive the feeling of anger (anger) appear. Now you need to dig deeper and find out the cause of the anger, what is left there guarded and not allowing it to be released and that makes situations recur. Anger is the child escape valve, it is only a release of contained emotions. Take heed to this symptom and discover within yourself the cause. Text revision: Lara Rosa Branca, Ale Sunshine e Ilza Barreto.